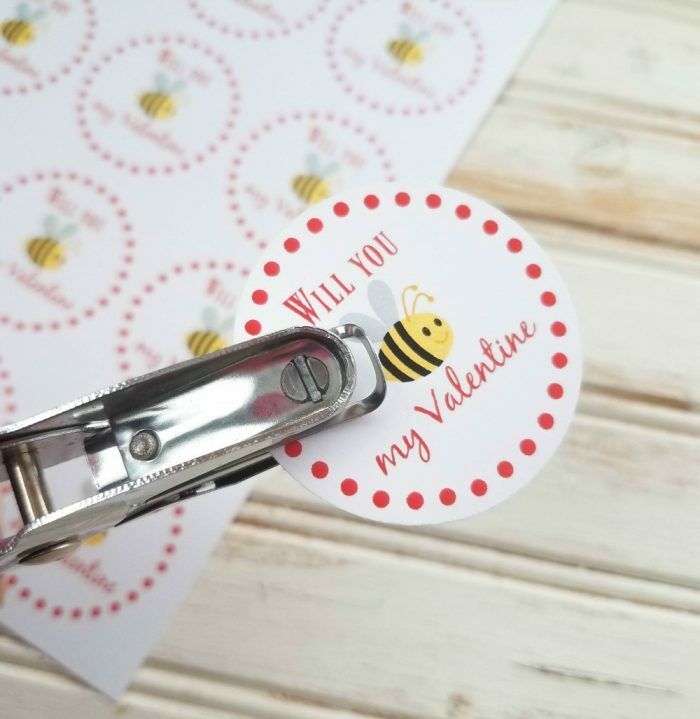 Valentine’s Day is jut around the corner and if you’re looking for simple Valentine gifts to pas out to your friends or co-workers, I’ve got just the thing for you to put together. 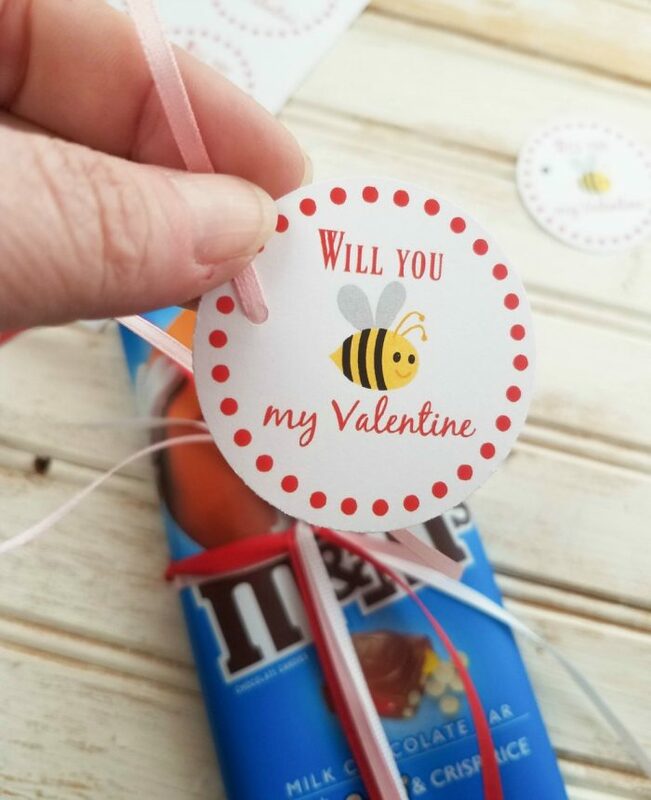 It’s delicious, inexpensive, simple to make; and I’m even sharing a free printable so that you can print these adorable tags yourself! 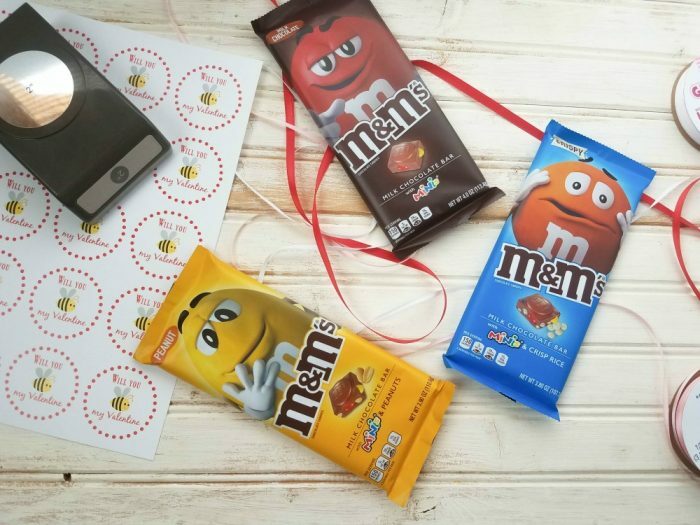 This project starts with the delicious new M&M?S? Chocolate Bars. 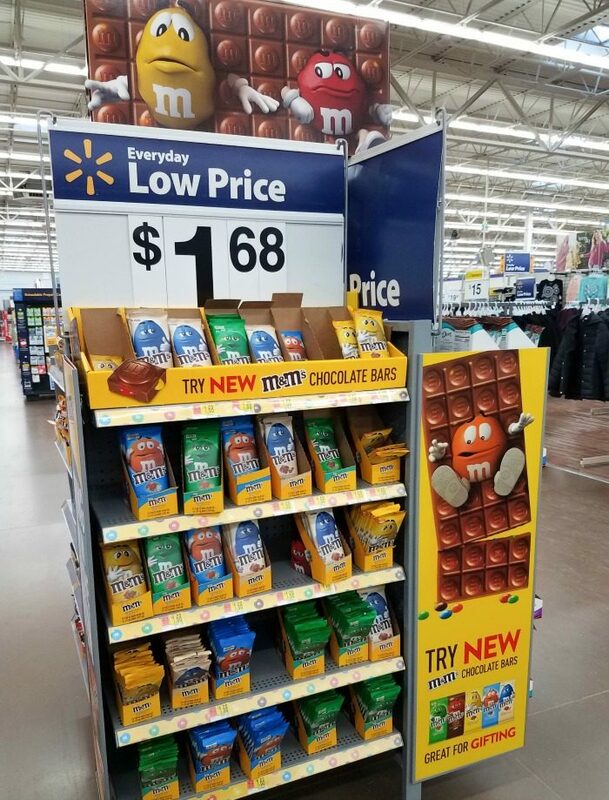 They’re available at Walmart in the candy aisle, and in special displays like the one below at the front of the store. They are shareable treats that are super tasty for snacking. There are five fun flavors available, including my favorite, the M&M?S? Crispy Tablet Bar. It’s crispy chocolate goodness with M&M?S? minis and crisp rice inside. You can also pick up the M&M?S? Peanut Tablet Bar with?M&M?S? minis and peanuts inside, or M&M?S? Milk Chocolate Tablet Bar with?M&M?S? minis inside.? You can try these new?M&M?S? 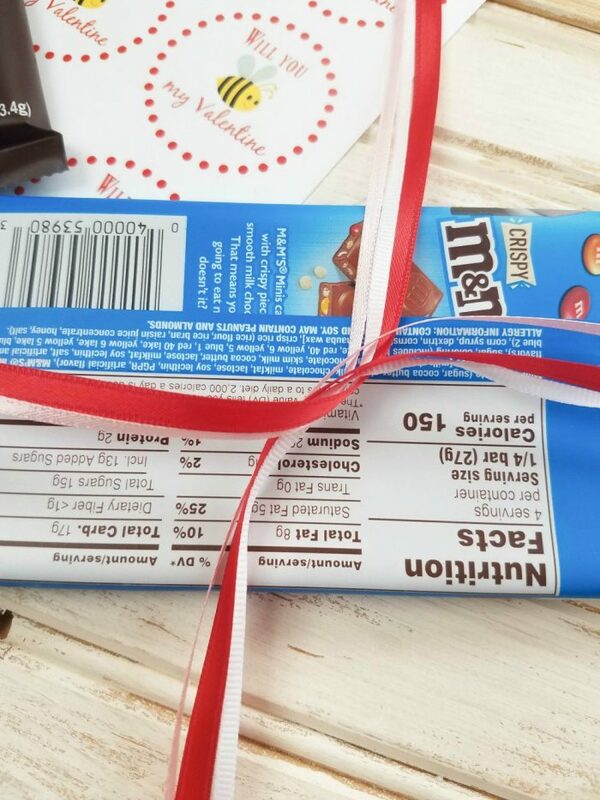 Chocolate Bars at a sampling event near you between 1/31-2/2. 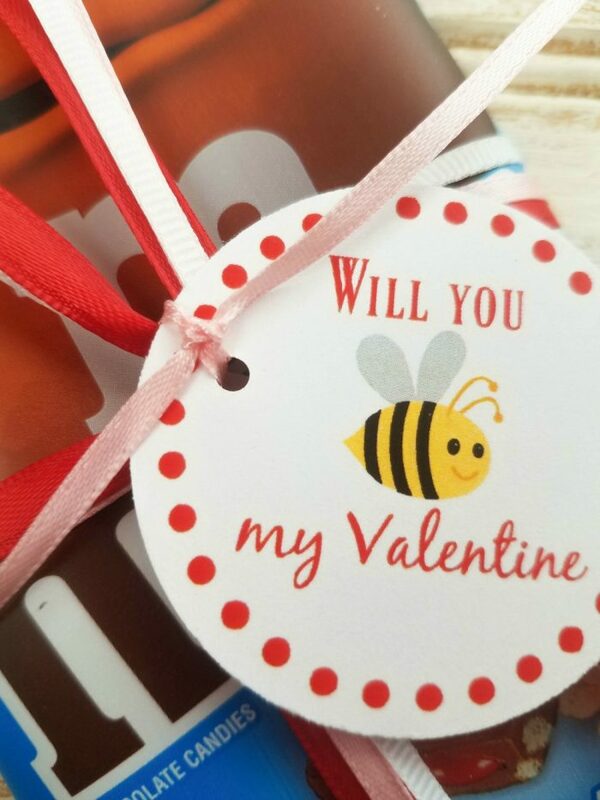 These are simple valentine gifts that you can pass out to anyone, and you can download the file here to print these tags at home. 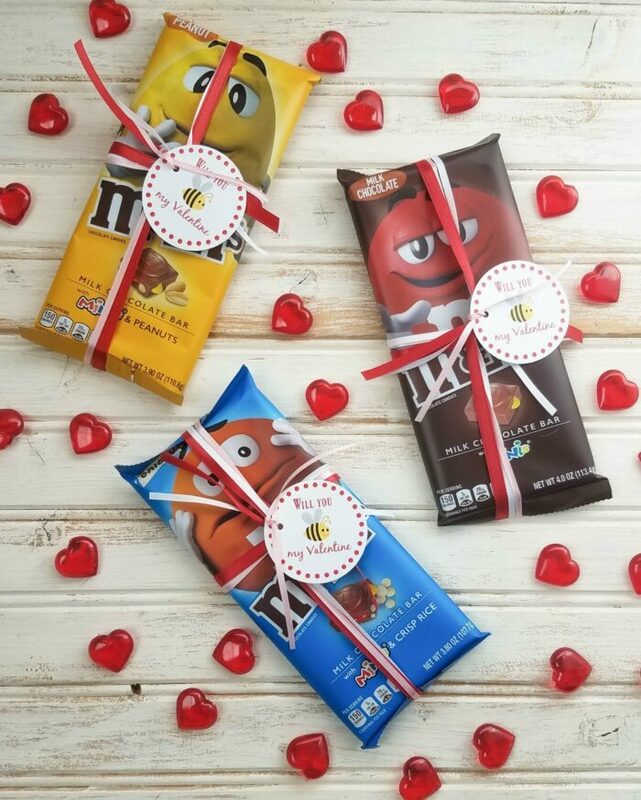 You can find more inspiration for these M&M?S? Chocolate Bars here. 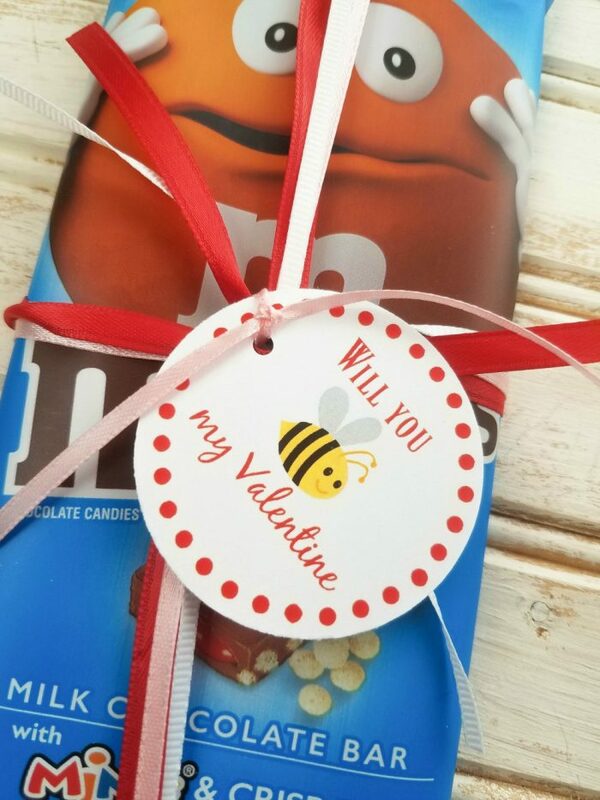 You will need the supplies in the photograph above (and listed below) to make these simple valentine gifts. Step 1.? 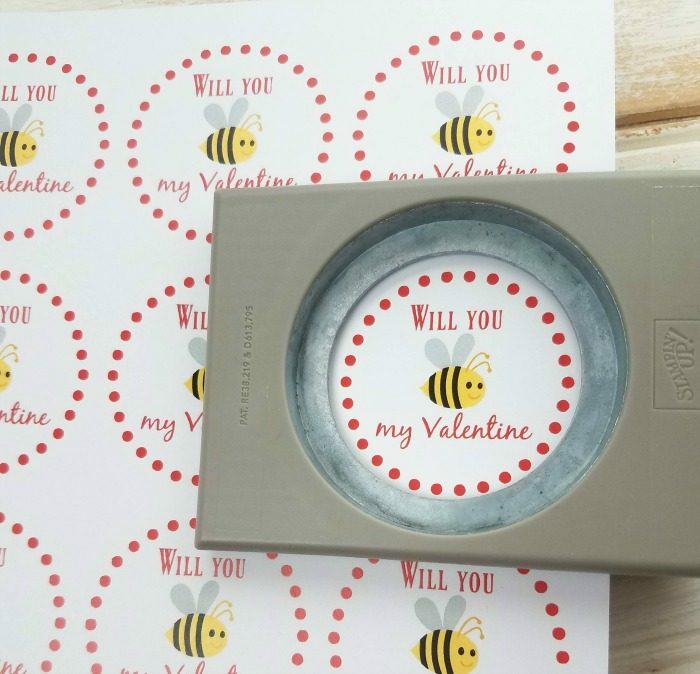 Download and print out your tags, then use a 2″ circle punch to punch them out. Step 2. Punch a hole on the left side of the bee. Step 3. Gather all of your ribbons and place it across the front of the M&M?S? Chocolate Bar, then wrap it around to the back. Tie once, so the ribbons loop through each other and bring them around to the front again. Step 4. Once the ribbon are on the front of the M&M?S? 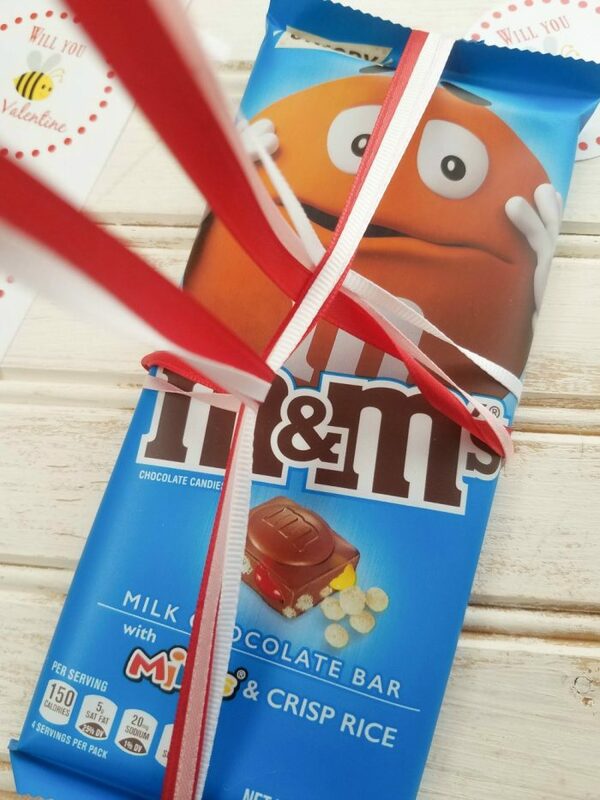 Chocolate Bar again, slide each end of ribbons underneath the first ribbon that you wrapped across the M&M?S? Chocolate Bar. ?Then tie it in a knot. Step 5. Now take your thinnest ribbon and weave it through the hole you punched in the valentine label, then tie each end of that ribbon together. Step 6. Cut the ends off each ribbon, leaving about 2-3 inches to keep it looking decorative. Now see how simple that is? 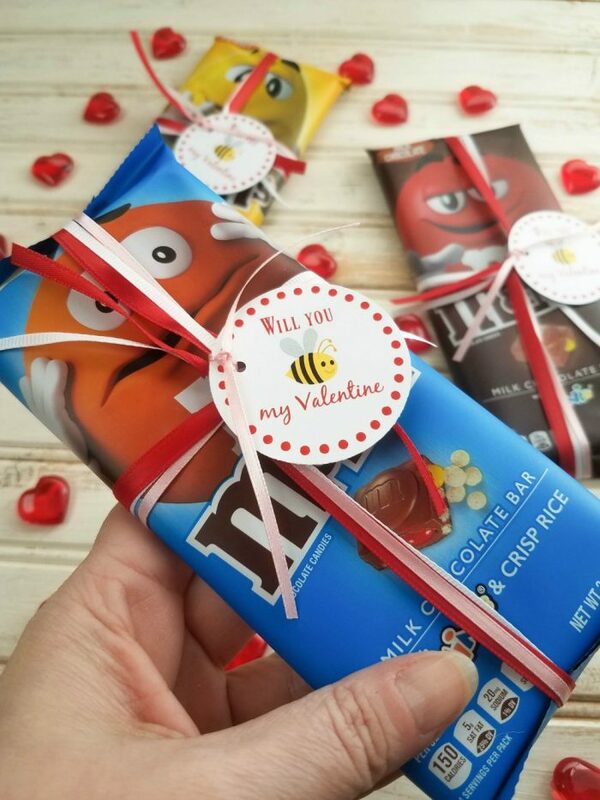 And these M&M’s candy bars are super tasty, so whoever your recipient(s) will be, they will surely appreciate and enjoy such a thoughtful (and tasty) gift for Valentine’s Day! 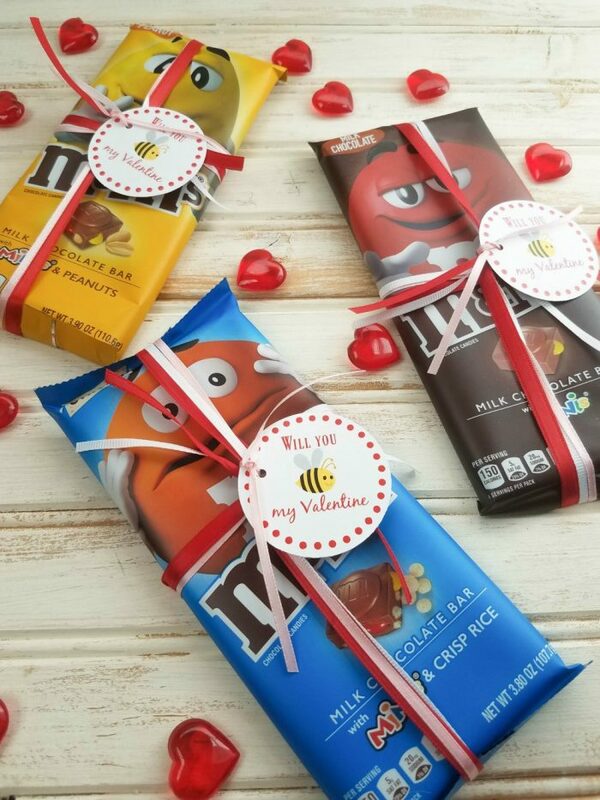 Pass these out to your friends, neighbors or anyone else that you just want to present with a special treat for Valentine’s Day. What a fun idea and cute printable. 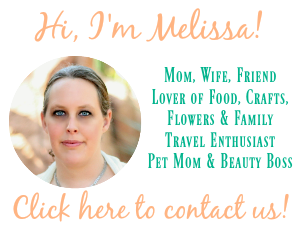 Those printables are so cute. I’m going to have to keep these in mind for next year. I think this is a great idea.